How long must I be off work? How long you are off work depends on what you do. If you do clerical work (i.e. stockbroker, teacher, or programmer), you can return to work when you feel up to it. This is a long weekend. If you do manual labor (entertainer, truck driver, trades, flight attendant, or trainer), do not work for three weeks. Regardless of your employment, do not lift anything weighing more than five pounds for three weeks. How long before I can travel? Traveling long distances or for long periods of time can be problematic after surgery. Generally, I do not recommend traveling longer than one hour for one week after surgery. When you do travel, you must have help at all times with your baggage (do not lift more that five pounds for three weeks) and you must get out of your seat and walk for five minutes every hour. Remember, even small vibrations during travel can increase the amount of pain that you experience. Finally, you will not have the same energy level as you did immediately before your surgery. The results are usually very long lasting (i.e. five to ten years). Implant failure, sun exposure, weight gain, weight loss, aging, and pregnancy will reduce the longevity of the results. To maintain the best result, it is important that you avoid sun exposure and drastic weight changes. How long will it take to get over my surgery? Bruising and swelling resolve in three to six weeks. Your energy or stamina takes six weeks to return. Final healing and scar softening takes six to twelve months for completion. Will there be any stitches to take out? No. I only use stitches that will be absorbed or wash out. I do this for you to eliminate the discomfort and stress of suture removal after surgery. What should I do if I have questions or problems after surgery? I recommend that you first review your written take-home instructions. If your question or concern is not answered, please call me at my office, at my home, or on my mobile phone. Call 911 for medical emergencies and life threatening problems. Each surgery can be separated into four parts. First, a plan is outlined on the patientÃ¢â‚¬â„¢s skin. Second, a skin incision is placed so that the subsequent scar(s) will be inconspicuous. Next, necessary surgery is completed beneath the skin, fat, and muscle (i.e. muscle tightening, implant placement, fat removal, and/or skin tightening). Finally, absorbable stitches are placed to close the incision in the skin. Is this outpatient or inpatient surgery? Virtually all cosmetic surgery can be done as an outpatient. Ninety nine percent of the surgery I perform is done in my office. Some patients choose to have home nursing care, which is arranged through my office. 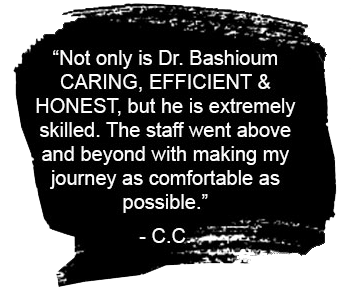 Most cosmetic surgery (99%) is done in the operating room at the Bashioum Cosmetic Surgery Center, Ltd. If desired, surgery can be done at one of the area hospitals. Home nursing care can be arranged through my office. What can I tell my friends and family so they will not know that I have had surgery? I recommend that you be honest with yourself, family, and friends. It is particularly important with regards to your spouse or significant other. You will be surprised to see how much support and approval you receive. How many times can I have the surgery done? Each time surgery is done, scar tissue is created in the surgical site. This scar tissue can detract from the natural result. For this reason, I recommend a specific surgery should be repeated no more than three or four times. Do I weigh too much to have surgery? Obesity does increase the risk of complications of many cosmetic surgery procedures. I recommend you be within twenty pounds of your ideal weight. I also suggest you complete any desired weight loss prior to surgery. Reducing your weight will optimize the result of your surgery, reduce your risks of complications, and may affect what surgery you choose. How soon after I have a baby can I have cosmetic surgery? Cosmetic surgery can be considered three to six months after delivery of a child. This will allow you to recover from the pregnancy, lose any excess weight, strengthen your abdominal muscles, and possibly finish breast-feeding. It will also eliminate the stress of caring for a newborn child. Can I have surgery when I am pregnant? No! Not only can the stress of surgery and potential complications affect your pregnancy but also any medications required can affect your unborn child. Cosmetic surgery should never be done when you are pregnant or when you might be pregnant. Am I too old to have the surgery? Improvements in appearance can be made at any age. As you get older, the changes do not last as long and they may not be as dramatic. At any age, serious medical conditions or poorly controlled medical conditions may make it unsafe to have cosmetic surgery. It is not uncommon for healthy septuagenarians or octogenarians to have cosmetic surgery. My mother was seventy-eight years old when she had facial rejuvenation surgery. This is a question that can only be answered after a consultation. There are many things to consider, including psychiatric conditions, life stress, medical illness, obesity, and motivation. You should be a healthy nonsmoker within twenty pounds of your ideal weight, not going through major life stress (i.e. grieving a death, changing jobs, divorcing), and motivated by internal desires to look better. When should I have the cosmetic surgery? You should consider cosmetic surgery when some physical attribute bothers you. People will seek out physical improvements at various times in their lives based on many things. Is it safe to do long surgeries? I recommend that the length of surgery be limited to six hours. Beyond this, I believe that the risk of complications becomes unacceptable for cosmetic surgery. Surgeries can be combined to yield dramatic and complimentary results. For safety reasons, I recommend the length of surgery be limited to six hours. Except for liposuction, I suggest no more than one area of the body be treated at the same time. There are always other choices when it comes to cosmetic surgery. These include other cosmetic surgery procedures, makeup, weight loss, acceptance of a deformity, or changes in clothing styles. Always consider all your choices before choosing cosmetic surgery. For general health reasons, I recommend that all my patients stop smoking. It is clear that smoking increases your risk for developing all sorts of cancers. Breathing problems like emphysema and circulatory problems, including heart attacks, are also linked to smoking. Smoking can increase the risk of coughing after your surgery, which may lead to unwanted bleeding. Finally, the chemicals released from burning tobacco also reduce blood flow, which can result in skin loss during the healing period. It is always best to stop smoking. Body development can continue into the early twenties. When surgery is done before this time, there is a chance the surgery will have to be repeated. In addition, it may be difficult emotionally to adjust to the surgery during teen years. For these reasons, I suggest surgery be postponed if possible until eighteen years of age. Notable exceptions to this are ear surgery and breast reduction. Everyone in the United States wants the latest in medical care. Unfortunately, this is not always the best medical care. At times, media presentations will leave out critical information about potential complications, quality of results, and FDA regulations. I am open-minded when it comes to new technology but I would rather not expose my patients to the newest techniques until they have been proven to be effective and safe. I have heard about so many bad things on television, is it safe to do cosmetic surgery? There are always risks to having cosmetic surgery. Serious problems are usually related to excessive surgery and/or undiagnosed medical conditions. I believe cosmetic surgery can be done safely with a high degree of patient satisfaction. Can people of color have cosmetic surgery? Native Americans, Asians, and Blacks have a greater risk of thickened scars (hypertrophic scars and keloid scars) after surgery. If you have a history of this condition regardless of skin color, I do not recommend cosmetic surgery. Also, surgery scars in these populations will be either lighter or darker than the original skin tone. Will this affect muscle function? Anytime surgery is done there is a risk of changes in muscle function. This can be a result of stretching, bruising, swelling, and/or cutting nerves or muscles. Most major nerves and muscles are avoided when I do surgery but there is variability in anatomy or nerve position. Fortunately, most changes in muscle or nerve function are temporary. It can take one to two years for function to return. Will this affect the skin sensation? Anytime surgery is done there is a risk of loss of skin feeling or sensation. This can be a result of stretching, bruising, swelling, and/or cutting nerves. Most major nerves are avoided when I do surgery but there is variability in anatomy or nerve position. Fortunately, most changes in feeling or sensation are temporary. It can take one to two years for nerves to heal and recover. Are there costs to have surgery to correct unsatisfactory results? Yes. Anesthesia and operating room costs are part of any surgical procedure. In addition, implant costs and professional fees may be necessary. Each case is different. Please ask about costs of revision surgery at the time of initial consultation. How often will more surgery be necessary to give me the result that I want? Ten percent of the time more surgery or treatments are necessary during the first year to give you the result you want. This includes all types of secondary treatment. There are risks with any surgery. Infection, excessive bleeding, abnormal scarring, poor healing, slow healing, skin loss, changes in skin sensation, and muscle or nerve injury, although uncommon, can occur. Fortunately, many problems that result from such complications are correctable with additional surgery. You must understand your risk of complications completely before you choose to have cosmetic surgery. Is FDA (Food and Drug Administration) approval important? We entrust the FDA (Food and Drug Administration) to judiciously examine medications, implants, and certain medical treatments to verify efficacy and safety. As a physician practicing in the United States, I believe it is important to follow the FDAÃ¢â‚¬â„¢s rulings. There are treatments and drugs popularized by physicians which are not approved. I choose not to provide treatments until FDA examination and approval have been completed. This may be the most frequently ask question. This stems from the misconception that cosmetic surgery can eliminate scars. Traumatic and surgical scars are permanent. They will lighten over time, but some mark will remain in the skin forever. It is not possible to erase or eliminate scars. What are keloids or hypertrophic scars? It is normal for surgical scars to be red and firm during the six to twelve month healing period after surgery. Sometimes scars itch and burn and become widened, red, and raised. This may resolve on its own but frequently requires some form of treatment (pressure dressings, silicone sheeting, steroid injections, and/or surgery) with variable success. Rarely, scars will not only develop these hypertrophic symptoms, but also extend beyond the initial incision and overlap the skin. This is a keloid scar and is extremely difficult to treat. People of color (Native Americans, Asians, and Blacks) are at greater risk for developing both of these conditions. Scars are part of all surgery. It is important to know where surgical scars will be placed. They should be inconspicuous, as small as possible, and easily covered with clothing, hairstyles and/or makeup. Will my family and friends notice that I have had cosmetic surgery? Maybe. Usually, family and friends notice a change in your appearance but may attribute it to something else like weight loss or change in hairstyle. This is particularly true if the result is natural in appearance. Our greatest compliment is to have your friends and family notice a change in your appearance after surgery but not know what it is exactly. Do not be disappointed if no one notices any change at all. It is normal for your body to be different on each side. Surgery can reduce these differences but not eliminate them. It will be necessary for you to adjust to some asymmetry after your surgery. Will I look natural after the surgery? My goal for you is a completely natural look. When you look in the mirror after your surgery, I want you to see a change with which you are comfortable. Your friends should notice a change in your appearance without noticing that you have had cosmetic surgery. Does insurance pay for any of this surgery? Insurance does not pay for cosmetic surgery. Please call my office for an accurate price quote or better still, come in for a personal consultation. My suggested quotes include professional fees, anesthesia fees, operating room costs, equipment fees, and before and after care. They do not include hospitalization costs, prescriptions, home nursing care, preoperative history and physical examination, laboratory costs, or pathology fees. If you compare prices, make sure that you consider all these costs and fees. Also, most cosmetic surgery procedures require some time off work for a safe recovery. The most common cosmetic surgery that I do is breast enlargement surgery. The second most common is body contouring surgery (liposuction and tummy tucks) which is done for both men and women. Facial rejuvenation surgery (nose surgery, facelift, forehead lift, and eyelid surgery) comes in a close third. Cosmetic surgery (AKA nip and tuck or aesthetic surgery) enhances natural beauty. Skin, fat, and muscle are surgically removed, repositioned, reshaped, and/or tightened to rejuvenate, enhance, improve, and balance body proportions. If you are sensitive or concerned about some aspect of your physical appearance, cosmetic surgery can give a more youthful, refreshed, and balanced appearance. This should make you feel better about yourself.